The Ravens go from their current most heated rivalry to one of their former fiercest rivals this week, taking on the Tennessee Titans in Nashville. Back in the old AFC Central days, these two teams had some epic battles. 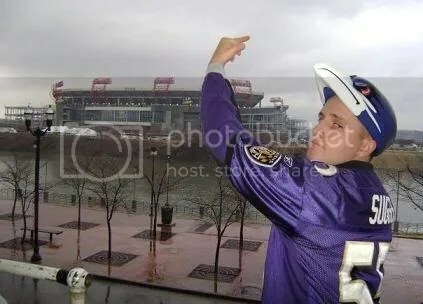 The Ravens were the first visiting team to win in what was then Adelphia Coliseum (now LP Field), and they knocked out the #1 seeded Titans on their way to the Super Bowl XXXV victory. The rivalry heated up again nicely in 2008, when these two played two more hotly contested games. During the regular season in Baltimore, the Ravens dominated the stat sheet but lost 13-10 on a last minute Titans’ touchdown drive that was aided by a very questionable roughing the passer call on Terrell Suggs. In the playoffs, the Titans once again had the #1 seed, and this time it was they who dominated most of the game only to lose at the end. In what we at the time described as a bit of cosmic justice, the Ravens’ game-winning drive was also aided by the officials, who gave Joe Flacco an extra second or two after the play clock had expired to get off a key snap that turned into a first down completion to Todd Heap. The rivalry has again gone dormant though, as those 2008 playoffs were the last time these two teams met. The Titans are no longer coached by Jeff Fisher, the guy at the helm for every one of those aforementioned rivalry games, and the NFL’s longest tenured head coach at the time he was let go. Mike Munchak takes over a squad that went 14-18 over Fisher’s final two seasons, and won only 6 games in 2010. Munchak is looking for his first win as an NFL head coach, as the Titans fell last week in Jackonsville 16-14. Veteran Matt Hasselbeck comes over from Seattle to quarterback the Titans this year. Hasselbeck has had some success against the Ravens in the past as a Seahawk; in 2007, he was 18/27 with 2 TDs and 2 INTs as Seattle rolled the Ravens 27-6, and in 2003 in Baltimore, he went 23/41 for 333 yards and FIVE touchdowns in that crazy game where the Ravens came back to win 44-41. Hasselbeck was respectable in his Titans’ debut, going 21/34 for 263, 1 TD, and 1 INT last week. The Ravens will look to get after him like they did Ben Roethlisberger last week, when they forced the Pittsburgh quarterback into five turnovers. They will again be without #1 cornerback rookie Jimmy Smith, who suffered a high ankle sprain in the Steelers game, and likely without Chris Carr, who is dealing with a hamstring issue. Tennessee’s main weapon in the passing game is third-year player Kenny Britt. Britt, who many Ravens fans were hoping to see the team draft back in 2009, caught 5 passes for 136 yards and two scores last week, including an 80 yard touchdown reception. Containing Britt will be no small task, especially considering that the Ravens’ main focus will still have to be on the Titans’ running game. Chris Johnson, perhaps the fastest man in the NFL, is coming off a very un-CJ2K like performance in Jacksonville, where he had just 9 carries for 24 yards. Johnson had success against the Ravens in the ’08 playoff game (11 carries, 72 yards) before leaving with an injury, after B’More had bottled him up well in week 5 (18/44). Johnson, like Jamaal Charles of Kansas City who the Ravens had to deal with in last year’s playoffs, can break off a 70 or 80 yard score at any time. Ravens’ nose tackle Terrance Cody played reasonably well against Pittsburgh, but he will really need to step up this week with Johnson taking handoffs. The Titans’ defense should realistically be easy pickens for the Ravens this week, considering what they did to Pittsburgh in week 1. Aside from cornerback Cortland Finnegan and former Bucs linebacker Barrett Rudd, there aren’t many recognizable names on the unit that gave up 323 yards (163 rushing) and 20 first downs to the Luke McCown-led Jaguars in week 1. Maurice Jones-Drew, a very similar back to Ray Rice, averaged over 4 yards per carry last week. The Ravens offense looked better against Pittsburgh last week than they ever have, and they need to carry that momentum forward to prove that it wasn’t just a fluke. The newly added speed, including tight ends Ed Dickson and Dennis Pitta, and wide receiver Lee Evans (who, though he didn’t have a catch, effectively opened up underneath routes for the backs and tight ends) made the Steelers look old and slow. B’More’s new-look offensive line had a very good game, and should only continue to get better. Look for the Ravens to again aim for a balanced attack (they had the same number of runs as passes last week), with Rice and the tight ends as the focus until Tennessee forces them to go elsewhere. The Titans and their fans will be fired up for their home opener. The Ravens, though, know that a let-down this week would immediately erase not only all those good feelings from the Steelers win, but also their advantage in the standings moving forward. Games like this always make Ravens fans, who remember Brian Billick teams continually losing to lesser teams, very uneasy. John Harbaugh squads have had no such issues during his tenure though (save for the Bengals), and the Ravens should be able to go into LP Field and handle their business. This entry was posted on September 16, 2011 at 8:46 am and is filed under Ravens, Ravens Game Previews. You can follow any responses to this entry through the RSS 2.0 feed. You can skip to the end and leave a response. Pinging is currently not allowed. Definitely a W this week.